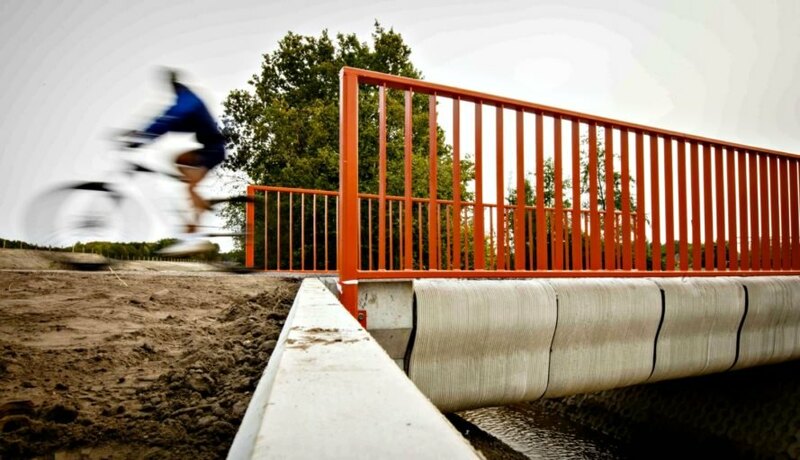 The Netherlands just made history by officially opening the world’s first 3D-printed bridge. On Tuesday, Dutch officials celebrated the opening of the innovative bridge, which is 8 meters (26 ft) long and located near the town of Gemert. Thanks to reinforced, pre-stressed concrete and 3D-printing techniques, the bridge (which is primarily intended for cyclists) can safely bear the weight of 40 trucks. In total, the structure took just three months to build. The bridge, which is 8 meters (26 feet) long, spans a water-filled ditch to connect two roads. Though the bridge is intended to be used by cyclists, the BAM Infra construction company determined that it can safely bear loads of up to two tonnes — or 40 trucks — through testing. It took the company just 3 months to build the bridge, which has approximately 800 layers. This project also established the eco-friendly benefits of 3D printing. “Fewer scarce resources were needed, and there was significantly less waste,” said Schimmel. The Netherlands is but one country experimenting with 3D-printed infrastructure. The United States and China, for instance, are using the cutting-edge technology to create structures from scratch without relying on traditional manpower. Elsewhere in The Netherlands, a Dutch start-up called MX3D has started printing a stainless-steel bridge. Reportedly, up to one-third is already completed, and they aim to complete it by March of 2018. Time will reveal what other fascinating, environmentally-friendly structures will be constructed using 3D printing. On Tuesday, Dutch officials celebrated the opening of the innovative bridge, which is 8 meters (26 ft) long and located near the town of Gemert.